Brysone’s introduction to Real Estate began in 1978 with a licensing course at the historic Coco Palms hotel in Wailua. His business practice is based on Integrity and Loyalty. Brysone expects the same from his clients. Being a SAA, (single agent agency), Brysone will represent only ONE party in each transaction. 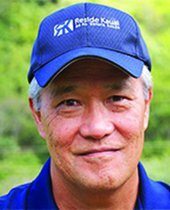 Born and raised on Kauai, and always living on the North Shore, Brysone currently resides with his wife Kathy on lands given to his ancestors by King Kamehameha. *Early 1950’s, Official Shell Picker at his family’s Hale Hoomaha Motel (Now Hanalei Colony Resort). *1957 Tsunami literally chased his family to higher ground in the Wainiha Valley. *1958 was an “extra” in the movie South Pacific. *1959 experienced the transition and changes of Statehood. *Late 1960’s, worked as a bellman at the Hanalei Plantation Hotel. *Surfed Hanalei when six buddies was a crowd, also experienced Aussie surfer invasion. *Owned and operated vacation rental property on the beach in Haena and also bought and sold investment property in Kilauea and Haena. "I am here to assist, if you decide to make this your home also. No sales hype, just the facts from my perspective."